The members of Coordination SUD condemn the grabbing of land, water and other natural resources linked to food. They devoted one of the first publications by the Agriculture and Food Commission (C2A) to this issue: Land grabbing, a threat to food security 1. In 2016, the Commission published recommendations on land policies that would help deal with this issue in Africa 2. That same year, it was represented by several of its members at a multi-stakeholder global forum devoted to finding possible plans for action, the Global Forum on Access to Land and Natural Resources (WFAL), held in València, Spain, from March 31 to April 2. The WFAL was attended by nearly 400 members of rural and urban citizen movements, research institutions and governmental organizations, all of whom represent tens of millions of people around the world. The participants discussed the causes of land and natural-resources dispossession suffered by people living in rural areas. They determined that the economic, social and ecological consequences of the eviction of these people are as tragic as those of global warming, and they called for unprecedented mobilization to obtain urgent change in public policies. Agricultural land and natural resources are being taken over and concentrated in the hands of an ever-smaller number of economic agents. This trend goes contrary to the aspira- tions put forward by the World Forum on Agrarian Reforms, held in Valencia in 2004 at the initiative of the International Center of Rural and Agriculture Studies (CERAI) along with Via Campesina and many civil society organizations. The publicly stated commitments made by States during the Inter- national Conference on Agrarian Reform and Rural Develop- ment in 2006 went unheeded. To assess both progress made and current blockage, as well as to search for solutions to this situation, a group made up of several peasant-organization and civil society networks, public institutions and resource persons from around the world decided in June 2014 to organize the WFAL. This project falls within the framework of the extension of the International Year of Family Farming in 2014 (IYFF), whose main stakeholders designated WFAL as an important process for increasing the influence of family farming on public policies and for better securing its interests. The World Rural Forum, which had helped create the IYFF, joined the WFAL International Organizing Committee as an observer member in November 2014. The WFAL also sought to contribute to the reflection started up following the adoption of the Voluntary Guidelines on the Responsible Governance of Tenure of Land, Fisheries and Forests in the Context of National Food Security (VGGT), to help further their application. These guidelines were established in 2012 by the Committee on World Food Security (CFS) after a long phase of listening to proposals from civil society. They laid down the principles for establishing land and natural-resource governance that encourages sustainable development. These principles represented some conceptual progress by national governments but did not address their effective implementation. The WFAL was recognized, in parti- cular by the Food and Agriculture Organization of the United Nations (FAO), which is in charge of the CFS Secretariat, as a useful system for bringing out concrete ideas to help make headway in their application. The WFAL dynamics mobilized a total of around 650 peasant organizations and rural and urban civil society organizations, around 10 national and international governmental organi- zations, and more than 600 individuals (including many researchers and some elected officials) from five continents 3. • A body of peasant and civil-society organizations, made up by the Network of Farmers and Producers Organisations of West Africa (ROPPA); the Mercosur Confederation of Family Farmers Organizations (COPROFAM), represented by the National Federation of Agricultural Workers of Brazil (CONTAG); the Indian landless peasant defense movement Ekta Parishad; ActionAid International; and Slow Food International. • A body of national and international governmental institutions, made up of FAO and the government ministries in charge of agricultural policies of Brazil, the Philippines and Senegal. • A body of experts, which made it possible to gather the contributions from key political and scientific figures4. This multiparty composition of the International Organizing Committee reflected the No. 1 principle of the forum wished by its organizers: guaranteeing exchange on equal footing between members of civil society and members of local, national and international governmental organizations. The guiding principle of the WFAL and one of its main characteristics is to make representatives of civil society and members of governmental institutions discuss issues on an equal footing. Its organizers insisted that all the participants conduct their exchanges within a framework of open discus- sion and that the documents recording their contributions to discussion (feedback, analyses, proposals, etc.) reflect the wide range of opinions expressed. This discussion rule was considered as fundamental from the start so that the exchanges could fully contribute to bringing out the most relevant analyses, citizen actions and political measures. The 2016 WFAL gathering brought together 390 participants from 64 countries and 5 continents. The majority were family and community users of land and natural resources (people working in agriculture, livestock raising, fishery and forestry, etc.). There were also urban citizens working for access to land and decent housing or in solidarity with rural organiza- tions, as well as members of local, national and international institutions and several elected officials. Africa was represented by 96 individuals from 25 countries. Latin America was represented by 67 individuals from 18 countries. There were relatively few participants from Asia (13 individuals from 12 countries), but the continent was quite well represented insofar as its participants delivered talks that made the audience realize the importance of Asia, where more than 80% of the world’s peasants live. There was a North American presence of around 12 individuals. The Forum was also attended by 215 European citizens from 12 countries. The participants from these latter two industrialized regions were largely representatives of rural and urban civil society organi- zations 5, but there were also students, researchers, elected officials, and representatives of administrations. This range of representation made it possible to present experiences from a very great variety of places around the world, all of which were useful in reflecting on the actions necessary. The members of the organizations that participated in the WFAL meeting represent tens of millions of people, or even more if we consider the members of their families. For three days, these nearly 400 participants compared their analyses in order to bring out political measures and possible ideas for action to halt and reverse the growing tendency of the grabbing of land and the wealth that stems from it. They worked each day in a plenary session as well as in workshops on a general theme and some of its particular dimensions, which had been determined beforehand by the International Organizing Committee and the participants through online preparatory exchanges. Day 1 sought to take stock of the current trends in access to land and natural resources. Day 2 was devoted to comparing the socio-economic performance of family and community uses of natural resources with that of large-scale capitalist wage-employment uses. The aim of Day 3 was to reflect on advisable political measures for resol- ving of land and natural-resource grabbing, as well as on the citizen actions needed to obtain their implementation. 1. The eviction of peasants and other community/family users from natural resources is a problem as serious as climate change. It calls for a radically different general orientation in public policies and for rules that deal with agriculture, land rights, investment and trade. This orientation must grant not only priority and secured access to land and natural resources and to other means of production for all these users, but also conditions that guarantee remunerative prices for those who require market outlets. 2. Giant projects are not the only cause for resource grabbing. Eviction of rural populations also occurs – and certainly to an even greater degree – because of the expansion of smaller-scale units that exploit natural resources, as this leads to the disap- pearance of activities (small farms, livestock raising, fishing, forest activities, etc.) that are crucial for very many people. 3. Along with the social, ecological, legal and political analyses, economic analysis is also required. This will facili- tate understanding of the absurdity and gravity of current national and international political orientations, in particular market deregulation of agricultural products and services and of investment. It will also highlight the fact that, with regard to transfers of usage rights of natural resources (whether it be of property, lease, partial use, or others), there is very frequently no control that would make it possible to avoid concentration of such rights. Economic analysis shows that large-scale capitalist wage-employment agriculture is less efficient than small-scale agriculture in terms of added value created per hectare and of the sharing of this value among members of society. 4. One of the main missions of local authorities and natio- nal public policies must be to ensure food supply to urban centers by local producers. This entails designing all the ensuing urban development processes, such as preservation of agricultural spaces to be used by peasant farming and policies to develop processing value chains and local markets (support for artisanal and local processing tools, and contracts to supply institutional catering of local products to schools, hospitals and administrations, etc.). 5. Unprecedented citizen mobilization is crucial to obtaining the necessary change in political orientation. This implies overcoming divisions within civil society and forming alliances with useful backing in the research world and among certain public bodies (administrations and elected officials). Civil society organizations may have different institutional priori- ties, hindering unified action. Common objectives for overall political change are needed for them to come together, and then a global campaign initiated by all the components of the alliance should be developed. 6. Other paths for the future have already been embarked upon: struggles against land and natural-resource grabbing, agro-ecology that creates many jobs, labor that has been given better value through shorter circuits using new urban-rural relations, etc. These must represent the founda- tion of the citizen movement to promote political change. National and global platforms must in this way enable both exchange of these experiences and the building – through their stakeholders and all the organizations wishing to take action in this direction – of the principles of changes and the proposals that take into account the specific characteristics of local contexts. 7. ROPPA and CONTAG/COPROFAM undertake to organize a future World Forum to contribute to the emergence and intensification of this alliance movement and to initiate demand for what will finally be an effective mobilization of States, which could be marked by an international conference similar to the one that deals with climate change. As part of its mission to support the collective advocacy of its members, Coordination SUD has set up working committees. The Agriculture and food Commission (C2A) brings together international solidarity NGOs working to realize the right to food and increase support for smallholder farming in policies that impact world food security: ActionAid France, Action contre la Faim, AEFJN, aGter, Artisans du Monde, AVSF, CARI, CCFDTerre Solidaire, CFSI, CRID, Gret, Inter Aide, Iram, ISF AgriSTA, MADERA, Oxfam France, Plate-Forme pour le Commerce Équitable, Secours Catholique-Caritas France, SOL and UNMFREO. The C2A is in charge of the representation of Coordination SUD to institutions dealing with agriculture and food, such as the Interministerial Group on Food Security (GISA) and the Civil Society Mechanism (CSM) for the Committee on World Food Security (CFS). This document was written by Mathieu Perdriault (Executive Secretary of WFAL 2016, aGter). 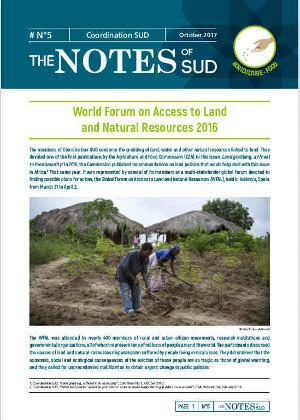 1 Coordination SUD, “Land grabbing, a threat to food security”, C2A Notes No.3, October 2010. 2 Coordination SUD, “What land policies should be promoted in order to make family farming in Africa more secure?”, C2A Notes No.24, February 2016. 5 aGter (which runs the WFAL Secretariat), AVSF, CCFD-Terre Solidaire, Confédération Paysanne and Secours Catholique-Caritas France were represented there. Coordina- tion SUD funded the participation by partner member organizations from Latin America and Africa.